Here are a few of my favorites from the Marni for H&M line. If only the pricetags were close to normal HM prices...I would be all over these bad boyz. Wishing you all a wonderful February weekend! P.S. Danielle has a beautiful blog, Take Heart. She asked me to share Gabe and I's love story. I was honored to be a part of the series. You can read it here. P.S.S. You have till Monday to enter the Shopkempt 50$ shopping spree giveaway! I love ALL of these pieces. If only my wallet allowed. And I just read your love story. It was so incredibly sweet. Congratulations on finding THE one. Love it all and wish it was cheaper, too. So I just read your story over at Take Heart and I have the knot thing in my throat! Such a great story and it gives me hope that God is preparing the one for me! I just have to be patient! I hope you have a great weekend! your love story is so wonderful. my goodness. amazing. Just saw it in "Vogue" magazine. Will go and have a look in march - i love the necklaces! Have a sweet weeekend Anna! Oh I can't wait for H&M to be online! I really hope they stick with that plan :) That color block tank is so pretty - I love it! Loved reading your love story over on take heart. So unbelievably adorable to see how your love evolved over the years! Love all the color in these pieces! Thanks for sharing! wow! these pieces are adorable! i love them! thanks for sharing! I'm obsessed with this collection! You picked out some awesome finds, girlfriend. But for real, I can't afford crazypants prices like this stuff either. It's why I go to H&M in the first place haha :) Off to check out your love story now! LOVE these pieces! they are so colourful and bright. But the prices I'm sure will stop me. And I'm so happy they'll make H&M available online here too! i am all over these! love them! I want all of it. Seriously SO good... all of it! Obsessed!! there are some pieces i like, but i am not that in love as i thought i would be! I love that colorblock top! I thought H&M went online last fall? Maybe I'm thinking of Zara. Oh I love love all of these brightly colored pieces Anna. They make me so ready for spring!!! Loving the Top the best! Neon will always have a place in my heart! Love those bracelets - that gray one is calling my name! im in love with color. The colorblocking is so fantastic! I'm loving it all! Especially the halter-style top...so pretty. I also just popped over to read your love story and it was breathtaking! Um WOW! You're kidding me with these incredibly magnificent color block combos!! Have a terrific weekend Anna! I wonder if the online site will serve New Zealand... Here's hoping! I LOVE that tank top, so pretty! 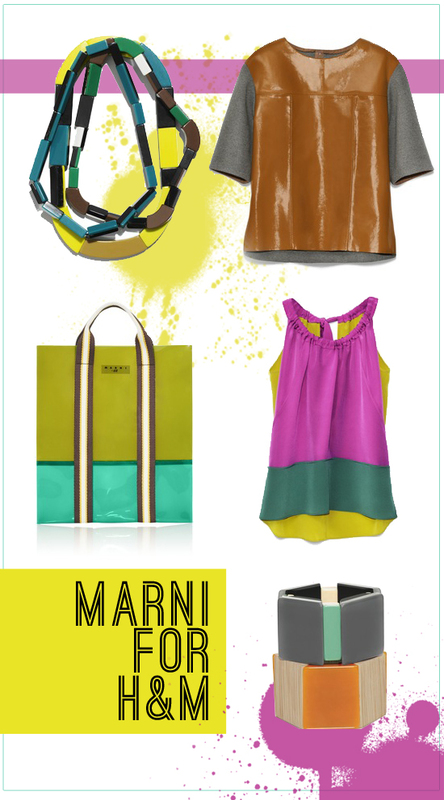 Love all the Marni for H&M accessories :) They are adorable. I like those bangles. It is good news to hear that H&M will be going on-line. whoa! love this line! especially those bracelets! These pieces are so chic! I adore the top on the top right, as well as the bangles—the colors are fabulous! yay, glad to hear H&M will finally start selling online. seriously, finally! I WIIIIIISH we had an H&M here in Oklahoma! Great stuff!